A queer music maker who knows how to put words and music together in heartbreakingly honest snippets of human life. 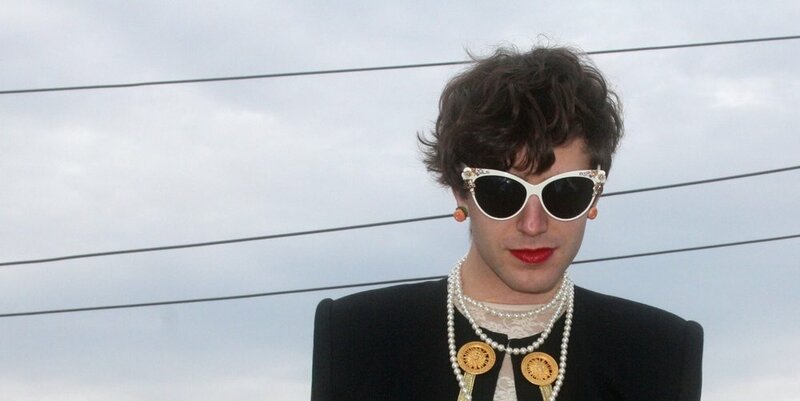 Ezra Furman has spent years looking through the window and the rest of society, and the pictures that he creates in his music because of this are incredibly clear, precise, and tragic. He’s like an early Neil Young, taking each treasure of an experience and faceting it in a the golden light of music, crystalized like amber, immortal for the world to keep until the world is gone. A thoughtful lyricist taking his poetic inspiration, songcraft ideas, and even a few fashion cues from Bob Dylan, Ezra Furman sings in a nasally style similar to the Violent Femmes' Gordon Gano while making unpretentious indie folk/indie pop that's raw, deep, and achingly sentimental. As students of Tufts University, guitarist Jahn Soon, bassist Job Mukkada, and drummer Jordan Kozer formed the Harpoons as Furman's backing band in 2006 and self-recorded Beat, Beat, Beat in their dorm rooms with the help of engineer Dave Kant of Outtake Records. After self-releasing a limited run of the album and making their first tour of the States, producer Brian Deck (Modest Mouse, Iron & Wine) took notice and pulled the band into the studio to record. The result was Banging Down the Doors, a sincere, awkward, and moving debut released by Minty Fresh in August of 2007. Only a year later, despite extensive touring, Furman found time to write another album's worth of material, and the second Ezra Furman & the Harpoons record, Inside the Human Body, was released in October of 2008. Mysterious Power followed in 2011 before Furman released his first solo album, Year of No Returning, in 2013. By 2014, his reputation in the indie world had grown considerably, especially in Britain, leading to his signing with the London-based Bella Union label later that year. His second solo release, the critically acclaimed Perpetual Motion People, was released in June 2015. After extensive touring, Furman decided to wind down his live band the Boyfriends, reshaping them into the Visions. In keeping with the spirit of change, Furman altered his sound for the next record, 2018's Transangelic Exodus, which featured a darker, more dramatic approach with a clutch of songs about synthetically created outlaw angels, those who love them and fear them, and those who refuse the current state of repression in the 2010s political world order and are likely to be persecuted for it. So today, with my sleeves heavy with burden, I choose Ezra Furman’s "Every Feeling" as my, with a little more strength, one more step, like a million pounds worth of feathers, song for a, sometimes you just need to feel all of them, what does one more matter, enjoy the vortex of swirling emotions - it means you can still feel them, Thursday.